The app that puts the serendipity back into social media. Introducing friendly - the social, social network. In the 21st century, we are all so connected to people online yet so disconnected from people offline. The friendly application is here to change that. There are millions of friendly people in this world, social networks have made them easier to find - friendly is the social, social network, meaning that you can find them; and meet up with them just by using your mobile device. It’s not online chatting - it’s offline chatting. 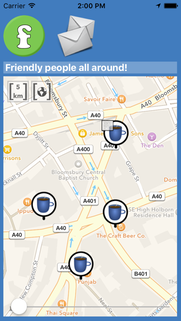 When you are feeling lonely, up for a coffee or just looking for a friend: tap the friendly button, instantly you are connected with dozens of people around your area looking for a friendly meetup. Have a coffee, go to a restaurant - make friends. Human connection has never been this easy. Click the button to go ‘online’, friendly will look for people around your local area who are ‘online’, too. They can message you or you can message them for a meetup. Click to get their directions, and see how far away they are. Then just meet them - it’s as easy as 1, 2, 3... literally. It’s not dating - it’s pure friendship; real friendship. friendly isn’t full of fake pictures - because there are none. There is no personal information to view, you don’t sign up to use friendly - it’s blind friendship. Making friends has never been easier, friendly is the true definition of social - it’s the social, social network. Meet friendly people around your local area. It’s no dating; it’s blind friendship.